The picture opposite, a deserted street in Keet Seel, an ancient Anasazi village in northern Arizona, serves at once as both a lifeless and vivid reminder that the complexity of life demands a direct tie between ethics and policy for our communities to be sustainable and capable of further evolution. In "simpler" times, people holding shared purposes, values, and visions of a desired future lived and died in communities like Keet Seel. Such villages provided hope, identity, and purpose for their members. In our relatively more complex times, organizations of all sorts and sizes provide a substantial measure of hope, identity, and purpose for its members as well. The Anasazi, who built and populated Keet Seel among hundreds of other villages, survived and thrived as a culture for over a millennium. They lived in a harsh, dramatically beautiful environment, only to leave the high desert plateau they had called home within a few generations of building such villages. Leaving relatively suddenly, and over a short period in the thirteenth century, they ultimately lost their separate identity as they merged with other tribes. They left more questions than their ruined villages, pots, rock art, and middens can answer. 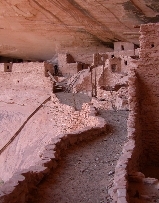 If we are to achieve "sustainability," and avoid the fate of the Anasazi, the first step must be to learn to think and dialogue systemically in terms of levels of consciousness, connectedness, and processes. In sum, to link our ethics-especially developing notions of social responsibility and organizational ethics-and our policy at all levels of our society. Applied ethics specialties may have lost sight of what traditional ethics was trying to accomplish: a good life for good people over a lifetime in society with others. Ethical integration is essential for all organizations. This may be especially true for health care, where there is a prevailing frustration among health care providers. "Business and health care do not mix," it is said. But, where health care is provided and funded by business, and received by business employees (and their families) as a significant part of compensation, this proposition is untenable. The expression reflects an unintegrated approach to health care ethics. The Ethics & Policy Integration Model, opposite, depicts the integration of applied ethics and policy. It portrays a comprehensive applied ethics and policy framework for systems thinking and dialogue. This framework is composed of four specialized circles of ethical consciousness, communicating, choosing, acting, learning, and being all brought together by ethical leadership where they overlap at the sigma point ("S"). Each circle represents an independent approach to applied ethics: the ethics of Essential Social Responsibility, Social Purpose, Organizational Life, and the Ethics of Ecological Relationships or Environmental Ethics. Within each circle are applied ethics approaches raising and treating issues distinct to its own arena. In this model, a contribution from each circle is a necessary, but not sufficient, condition for an effective ethics system. Ethical leadership, at all levels, identifies those approaches that are appropriate to a particular organization or community and integrates them. Within the Ethics of Essential Social Responsibility are three broad categories: government, for-profit, and not-for-profit. Each has broadly different responsibilities within society, which are of the essence of its nature. Each has different key participants. Each has different constraints on action. The essence of government is the appropriate application of its monopoly on the exercise of coercion and violence: the police, the military, and the courts. Its key participants are governors, the governed, and taxpayers. Bureaucracy and stability characterizes its institutions. The essence of for-profits is meeting the most urgent needs of owners and consumers through free exchange: business and the professions. Key participants are owners, employees, vendors/suppliers, consumers, and those affected by their activities: other people, communities, and governments. Profits and adapting to changing customer needs characterizes its institutions. The essence of not-for-profits is meeting the needs and values of a community without coercion or exchange: charity or philanthropy. Its key participants are charitable organizations or associations, beneficiaries, and donors, and the community as a whole. Recognizing needs of the community and soliciting community support characterize its institutions. These are the essences, but there is much overlap, which makes ethical policy more difficult. In the area of health care, Federal subsidization of corporate employee benefits and Medicare and Medicaid are examples. The Ethics of Social Purpose includes biomedical ethics, nursing ethics, banking ethics, legal ethics, accounting ethics, engineering ethics, marketing ethics, or the military ethics, to name but a few. Which bodies of ethics apply to a particular organization depends upon its visionand the tasks required to achieve it. Under some circumstances, such as a hospital in a combat zone, many of these ethics approaches would apply, and need to be integrated. The Ethics of Organizational Life or Systems Ethics is the domain of the ethics structures, compliance systems, practices, procedures, and protocols necessary for a body of people to achieve shared visions in accordance with its core values and organizational culture. The thrust of organizational ethics is to increase human energy, knowledge, and trust, and to drive out fear. Systems ethics applies to all organizational life, regardless of specific social purpose. It shapes the conditions of organizational life, the content of dialogue or conflict resolution, and the context for the ethical framing, choosing, and actions of the other circles. It is where ethical leadership may perhaps best be exercised, again at all levels. The Ethics of Ecological Relationships is the domain of the relationships between our species and world of which we are an integral part. It is the most fundamental of all approaches to applied ethics. It addresses who we are, what the rest of the world is, and our relationship to the world as a whole. In its most fundamental and comprehensive form, it is contains each individual's worldview. Following the distinction made by the great Austrian Economist, Ludwig von Mises, between worldview and ideology, the other three circles represent ideologies, ways thought to be good or best to deal with the world as a whole. But this circle of ecological relationship, represents what is the best way to approach the world of which we are an integral part. The others may be thought to have largely instrumental value. Ones relationship in the world is by definition an intrinsic value. Turning to patient care, there is clearly an ethical dynamic that goes far beyond biomedical ethics alone. However, "the whole [of medicine] has often been likened to a jigsaw being pieced together by strangers, each of whom is only guessing at the picture." The Ethics & Policy Integration Model is designed to help the manager bring these pieces together. First, patient care depends in part upon the nature of the entity. Is this a governmental, for-profit, or not-for-profit hospital? Each area has different organizational providers, users, and payers. In concept, one area is politically driven, one is market-driven, one is community support-driven. To what extent is the patient funding his or her own care? Since the cost of health care is largely financed by third parties (government, employer-paid insurers, or charity), this raises complex issues of individual and social responsibility, which any comprehensive ethics of health care must surface and treat. Should the answers to these questions even be involved in determining the patient's level of care? At first glance, a resounding no, seems right. But consider its implications. A governmental scheme typically provides something to which a limited part of a society is entitled at the expense of the rest, that is, the taxpayers. If government is single payer in a system, everyone is entitled at the expense of everyone who pays taxes. This is inherently political, bureaucratic. It can be no other way. Government patients have no real choice in the matter if they stay within the system. A veteran wishing to exercise his or her veteran's benefits must go through a bureaucratic process. Welfare claimants deal with still more. Otherwise, the patient in a governmental scheme can demand all the care he or she desires-effectively having an unlimited right to tap the taxpayer. It is much the same for the not-for-profit hospital since only the method (but not the source) of fundraising is different. Only the for-profit hospital provides the patient with a direct choice of services; the patient can take his or her (insurance) money elsewhere. Second, some speak of biomedical ethics, and the physician's role in applying it, as though it were equivalent to health care ethics. But while biomedical ethics raises important health care issues, it is hardly comprehensive. Biomedical ethics, in its purest form, is only part of the social purpose of a health care system. Nursing, dealing more with care than cure, raises still other issues. Medical research and teaching raise still others. Biomedical ethics does not drive the health care system any more than engineering ethics drives uEPICn planning or the highway system. Why? Because the essence of biomedical ethics leaves untreated significant ethical issues of individual and social responsibility, which impact all of us, health care providers in particular. At the 1997 Emory Intensive Course in Health Care Ethics, for example, a panel examined a hypothetical involving whether to provide lifelong health care to a 14-year old auto accident victim from various normative approaches: utilitarian, narrative, economic, and feminist. Not once was the concept of responsibility employed. Consider the implications of such a view. A physician is to make a decision regarding the care of the patient without regard to the patient's responsibility for his or her own condition or the resources available. He or she owes a patient unlimited advocacy for treatment without regard to past causes or future consequences; the physician "deals with the problem at hand." In this view, it makes little difference that patients pursue dangerous lifestyles (smoked, refused to wear a helmet, used IV drugs, drove while talking on a cell phone, etc. ), choose to live life on the streets, and refuse to follow medical advice. They are entitled to the same care as those who sacrificed to maintain good bodily and mental health and to be sure he or she could afford quality health care. Further, under this view, it is not relevant that resources of time, energy, and money are limited across the health care system. Certainly at the moment of care, the physician should have the primacy of the patient's wefare in mind. That is a proper role of biomedical ethics. But reality requires that health care ethics take a broader view. Health care ethical framing and choosing must incorporate all appropriate approaches to ethics. Rationing of care does exist. One need only look at waiting lists in government single-payer systems to see it in action. Moreover, where rationing does formally exist, the physician is generally precluded from advocating for the patient when there are no resources available within the system. Are physicians then acting unethically? Is the system unethical? Surely neither the provider nor the system can be deemed unethical, where even the most liberal of health care policy proposals contain some limits. But if physicians in such systems, as well as the systems themselves, are deemed to be ethical under these circumstances, what meaning is to be found in a biomedical ethics of unlimited advocacy for the health care system as a whole? How can a system work when its principal decision-makers are charged only with "dealing with the problem at hand" and not with the system itself? Thirdly, organizational ethics makes a difference. Ethical leadership is difficult. The bounds of responsibility for the care of a patient in a large hospital are often unclear, perhaps even, as Daniel F. Chambliss suggests, purposefully blurred. Attending physicians make decisions bounded by the decisions and actions of interested others: administrator guidelines; day-to-day decisions by residents, nurses, and aides; and daily routines. Interdisciplinary fear characterizes much of hospital life: administrators vs. physicians, physicians vs. nurses, payers vs. providers, patients vs. the system as a whole. Biomedical ethics ignores the systemic, organizational issues that Chambliss calls "ethical problems" as opposed to "ethical dilemmas." It ignores the difference between these and "ethical conditions," which cannot be changed, they just are and need to be dealt with, not solved. As a result, health care providers are left vulnerable to feelings of hypocrisy and fear when situations they deal with on a daily basis demand a broader view for resolution than biomedical ethics permits. Taking such a narrow view results in physician decisions being constantly second-guessed by responsible others, who have different, equally limited, ethical and policy perspectives. It places physicians and nurses into situations where they feel hypocritical precisely because they do, in fact, make decisions based upon the limited time, energy, and, yes, money available. Finally, the Ethics of Ecological Relationships must be considered. Health care takes place within a context of evolving life. We influence evolution in many ways, ours and other lives-and potential lives. These ecological relationships define us. One way they define us is whether we are in harmony with our world, or at war with it. Whether we contribute to the world as a place for evolution, learning, and growth, or exploit it only as a means to maintaining existence. Even more at issue are the limits on action that we recognize on our capacity to influence the course of na-ture-and the evolution that naturally occurs within it. The fact that we have the authority to shape our lives, that is, the power to do something, does not mean that it should be done. For example, to increase the quality of human life, is it appropriate, as a matter of policy, to destroy another species e.g., the small pox virus? Recognizing that some species evolve faster than we, and our technologies, evolve, is it ethical or even effective over the long run to kill members of a species to improve the quality of human life, e.g., antibiotic regimens? When is quarantine of the infected appropriate? When does human life begin? What are the long-term consequences of cloning life, especially human life? What is to be done with hazardous waste, especially bio-radiological and infectious waste? How far can the quality of other species' lives be affected to improve the quality of human life? When does bringing a human being into the world or keeping a human being alive become inappropriate, unreasonably unnatural, or inhuman? At the S point, the point where all four circles overlap, lie the skills, knowledge, understanding and attitudes ("SKUA") necessary for shared purposes to be achieved, informed choices to be made, authority to be exercised, and learning and growth to occur. Together, the SKUA are es-sential for the necessary systemic thinking and dialogue to occur. The role of ethical leadership, then, is to bring together the required capacities and competencies through training, education, and development. Visualizing such a matrix, there is for each of the eight elements a package of training, education, and development to build and shape the SKUA required to be competent. Moreover, for ethics and policy to be integrated toward systemic thinking and dialogue and cooperative inquiry, action, and learning, these SKUA need to be developed at all levels of society: individual, family, organizational, community, nation, and global. We need serious, concerted efforts to integrate applied ethics and social responsibility at all levels, especially health care ethics. The Ethics & Policy Integration Model demonstrated here provides a foundation for the ethics and policy leader, academic, health care provider, and others. It allows them to take a formal structural approach toward integrating biomedical, nursing, and organizational ethics with its essential social responsibilities, and those of other key stakeholders in the health care system, including the environment. One structural approach in the health care arena is to integrate organizational ethics, social purpose, environmental ethics, and social responsibility functions and committees. Committees of responsible people would be formed for each discipline and meet as often as appropriate. Repre-sentatives from each committee might meet monthly, integrate their perspectives, and present their views to the Chief Executive Officer, Chief Operations Officer, and Chief Medical Officer in a hospital, for example. This deals with ethical complexity by giving essential social responsibility and environmental ethics formal voices as well as the more commonly heard voices of social purpose and, to a lesser degree, organizational ethics. Hopes for building sustainable communitiessocially, culturally, and physicallymust be founded on learning to think and dialogue systemically. The Ethics & Policy Integration Model provides a framework for bringing together the remarkable work that has been done in ethics and policy toward that end. It is founded, in turn, on the four fundamental concepts of shared purpose, informed choice, responsibility, and learning and growth. Again, using health care ethics as the example, on the theoretical level, we must put biomedical ethics into perspective and develop a truly comprehensive approach to health care ethics. Such an approach would take into account broader individual and social responsibilities. It would deal with the environmental aspects of both care and cure. It would address the toll the health care system places on its practitionersand that its practitioners place on one another. On the practical level, we need structures and systems integrating diverse ethical and policy perspectives. Taking both steps together, we will achieve the quality of care for patients, the quality of life for care givers, and the quality of dialogue on health care policy we need to avoid ethical chaos. Though it is not a simple or quick process, "Take two steps, and call me in the morning." Moreover, the schism between ethics and social responsibility may be especially true for health care, as there is a prevailing frustration among health care providers. "Business and health care do not mix," they complain. However, where health care is provided and funded by businessand received by business employees and their families as a significant part of compensationthis complaint is untenable. It reflects an unintegrated approach to health care ethics and policy. Linda K. Treviño and Katherine A. Nelson, Managing Business Ethics: Straight Talk About How To Do It Right (New York: John Wiley & Sons, 1995), 6, 72. Kenneth W. Johnson, "The Joy in Taking Responsibility. " Remarks to the Cadets of Valley Force Military Academy and College (April 8, 2001). See also a four-part definition of corporate social responsibility (economic, legal, ethical, and philanthropic) in Archie B. Carroll & Ann K. Buchholtz, Business & Society: Ethics and Stakeholder Management 4th ed. (Cincinnati, OH: South-Western College Publishing, 1999), 33-38. "Systems Thinking/Systems Talking About 'Social Responsibility'" Ethical Management (May 1996); "'Doing Well By Doing Good'? Well, why Not?" Ethical Management (July 1996). These articles concentrated on the social responsibilities of business. These three levels of social responsibility bear a deceptive degree of similarity to Lawrence Kohlberg's levels of moral development. Lawrence Kohlberg, "The Claim to Moral Adequacy of a Highest Stage if Moral Judgment," The Journal of Philosophy (Vol. LXX, 1973), 630-646. An earlier version of this article first appeared in the newsletter: Ethical Management.